Sorbus thibetica 'John Mitchell' is out of stock. Please take a look at Sorbus aria 'Lutescens' for a similar variety. An unusual Sorbus, 'John Mitchell' has large rounded leaves that are green on top and a contrasting silvery white underneath. When young, the leaves are covered in a white down and as they mature, only the upper of the leaf turns dark-green. In a breeze this difference in leaf colour is most effective. Sorbus thibetica 'John Mitchell' produces corymbs of larger than average white flower in May-June that are popular with bees. In the autumn, bunches of reddish brown berries are complimented with the foliage changing to yellow and bronze. The tree itself is upright and neat in form, ideal for small spaces and a very nice choice for brightening up a dark corner. 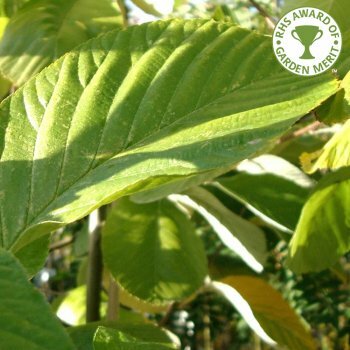 Known as a Tibetan Whitebeam tree, this Sorbus variety will grow to 6 x 4 metres in almost any soil type or condition. Our pot grown Tibetan Whitebeam trees can be planted at any time of the year. Start by removing weeds and grass within a metre of your desired planting hole. Dig a square hole as deep as your root mass and approximately 2x as wide. To help the tree establish more effectively, sprinkle root grow in the hole. We recommend planting Whitebeam trees with a stake and tie kit. For single stakes, place the stake at an angle to avoid penetrating the rootmass and knock it in until it is firm. Use a buckle tie, placing the spacer between the stake and tree. Tibetan Whitebeam trees require a strong framework to support their beautiful berries so it is good to encourage this by raising the crown in summer. Simply prune the lower branches and any crossing, damaged or diseased branches within the crown. Hard pruning of Tibetan Whitebeam trees can be carried out in the dormant season, from autumn to winter.